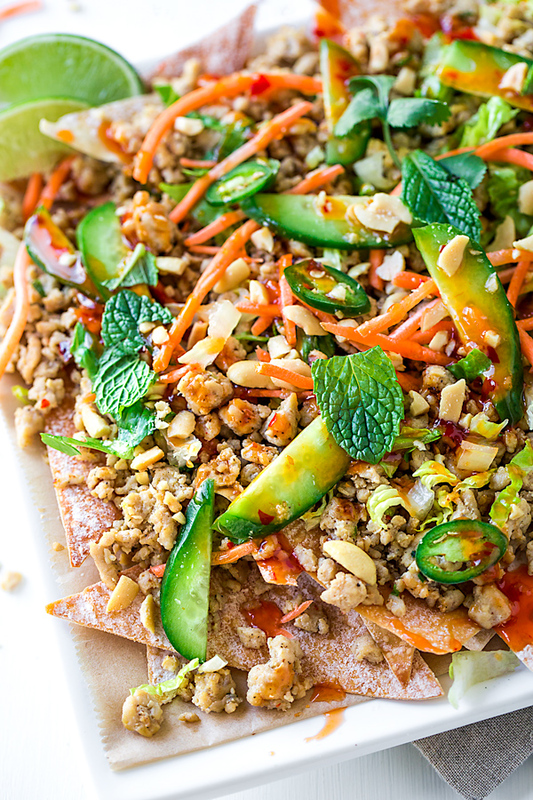 If Thai cuisine had its own version of nachos, then this recipe would be it! Filled with a delicious flavor combination of ginger, garlic, peanuts, sweet chili sauce, and lime, these Thai nachos are a fun fusion recipe that puts a spin on a classic. If you were to ask me to choose only one type of cuisine that is my absolute favorite—that go-to I never seem to tire of—I would very easily and without hesitation tell you that it is Thai food. The flavor in Thai food is so complex, so robust, and so colorful, that each and every bite taken of a well-prepared Thai dish is like an explosion of taste. Not to wax too poetic, but it truly is like a symphony of flavors in the mouth! There’s always tanginess, spiciness, and sweetness wonderfully woven together in Thai food, and in combination with crisp textures or cool elements, it’s incredibly exciting to eat and use as inspiration in creating fun new dishes of one’s own. And isn’t that what the “joy of cooking” is all about? Hence these Thai nachos, my personal little creation for an exciting and delicious addition to the hero list of tasty Thai appetizers. This recipe blends loads of Thai flavors into a classic that we all know and love, making it a fun fusion recipe that’s certain to surprise and tantalize your tastebuds. 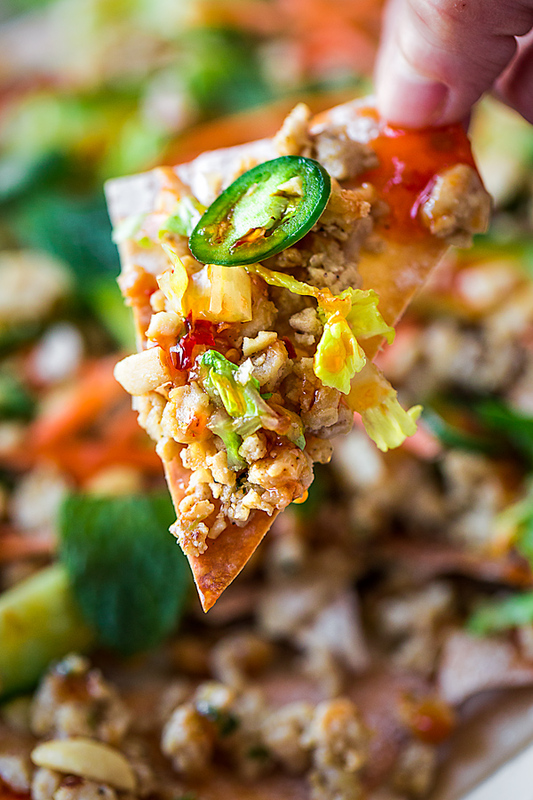 Thai Nachos, a Little Spicy, a Little Sweet, a Little Tangy, a Whole Lot of Flavor! If we’re talking Thai cuisine, then ingredients such as garlic, lime, ginger, cilantro, fish sauce, sweet chili sauce, peanuts, and green onions are definitely going to be on that list of often-used items. These are some of the ingredients that provide that multi-dimensional flavor that creates such vibrancy and color in that cuisine, and they are essential when preparing these Thai nachos. 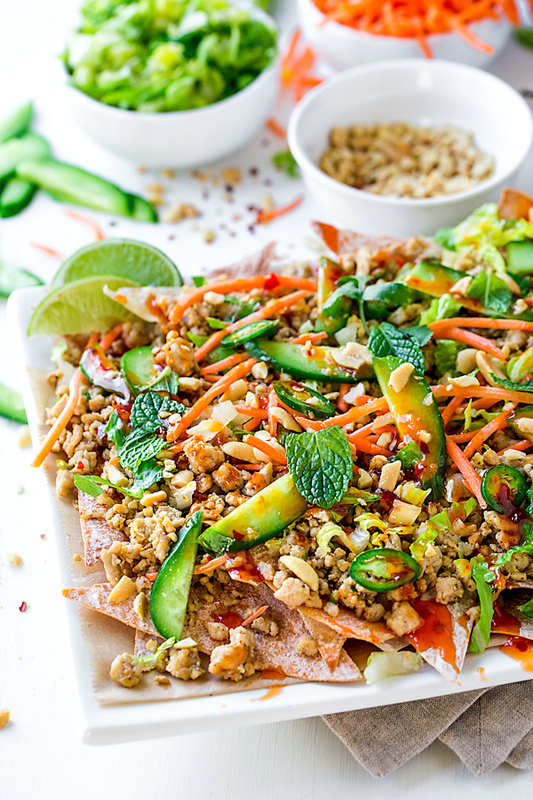 You’ll also typically find many ingredients in Thai cuisine that are cool and crispy, and often come in the form of fresh veggies such as cucumbers, shredded greens and carrots, and from crispy wontons and crushed peanuts—I’ve incorporated those into these scrumptious Thai nachos as well. I very quickly bake up some wonton skins (no frying required) and arrange them on a large platter. Then, I top the wonton skins liberally with the ground chicken mixture that has generous amounts of garlic, ginger, lime and green onion, and even a tiny little dash of fish sauce (which a small amount of this potent stuff goes a long way). I then add a colorful array of finely shredded greens, carrots and cucumbers, then drizzle over top of everything some sweet chili sauce. And to finish, a simple garnish of finely crushed peanuts, cilantro leaves, a few mint leaves, chili pepper slices, and a few wedges of lime to take things over the top. These Thai nachos are super fun, wonderfully delicious, and quite the cool surprise as an appetizer or a platter to share with friends and loved ones at home. They’re a little sweet, a little spicy, and a little tangy (and even quite healthy! ), and everything you’d want in a classic and fantastic fusion recipe! Bake the wontons to create your “chips”: I love that these Thai nachos are actually quite healthy, as you don’t even need to fry the wontons: simply cut the wrappers in half diagonally, spray lightly with cooking spray, and bake for 10-12 minutes until crispy-crunchy. Substitution for ground chicken: While ground chicken is delicious in these nachos, and nice and lean, you can very easily substitute ground pork or turkey, as they will pair terrifically with thai flavors. Make these extra spicy: If you’re a fan of the spiciness found in Thai food, then you can always add more heat by drizzling chili garlic sauce or even sambal over top. What you can prepare ahead: While you’ll want to wait to bake up your wonton skins the day you plan on assembling these nachos, you can easily prepare the ground chicken mixture ahead of time and reheat it prior to assembling. You can prep your other “garnishing” ingredients ahead as well. 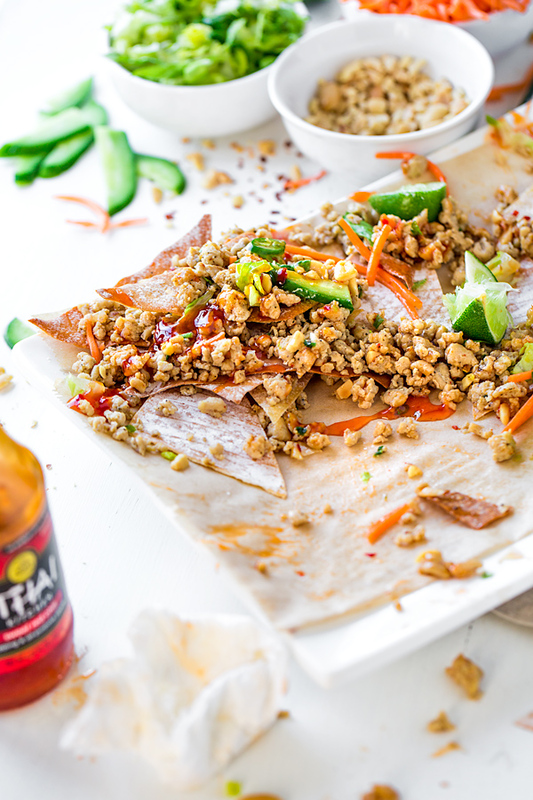 These delicious and crispy Thai nachos are loaded with lots of tasty Thai flavors from garlic, ginger, sweet chili sauce, peanuts, and a good kick of heat—they’re the perfect fusion recipe to add to your list of favorite Thai appetizers! –Preheat your oven to 350°, and line a large baking sheet (or two) with parchment paper. –Place the wonton wrapper triangles onto the baking sheet(s), trying to keep them from overlapping, and spray with cooking spray and sprinkle lightly with salt; bake for 10-12 minutes until golden and crispy; set aside. –Meanwhile, place a large skillet over medium-high heat, and drizzle in about 2 tablespoons of oil; once the skillet is hot, add in the diced onion and saute it for a couple minutes until soft; add in the ground chicken, along with a couple of pinches of salt and pepper, plus as much of the red pepper flakes as you’d like, and cook the mixture together breaking up the chicken into fine crumbles. –Once the chicken is cooked through, cook it a little while longer until no moisture is left in the skillet, and the chicken begins to lightly brown; at this point add in the garlic and ginger, and stir those in until aromatic, then add in the fish sauce, the squeeze of lime juice and the green onions, and stir those in until combined. –Allow the chicken mixture to very slightly cool to a “warm” temp. 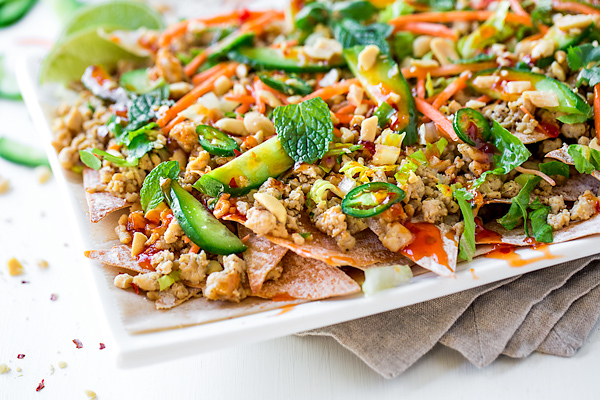 –To assemble your Thai nachos, scatter the crispy wonton chips onto a platter, and spoon over the ground chicken mixture; over top of that sprinkle the shredded romaine, carrots and cucumber, then drizzle the sweet chili sauce over everything. –Finish by sprinkling over top the chopped peanuts, as well as some cilantro and mint leaves, and serve with the lime wedges tucked in next to the nachos for squeezing. Interested in another Thai-inspired recipe? Check out these Thai Chicken Salad Wonton Cups! Hi, Ingrid! Both of these recipes look wonderful!!! Can’t wait to try them! Also, wanted to let you know that my Easter houska was baked to perfection in my new Wolf Countertop Oven! And just finished up another batch of your Everything Homemade Rolls–we love those and they do freeze very well, too! All my best and your food photos are great!